It's been a Really Long Time since I've had little kids around the house. This explains my complete ignorance of Super Why. A quick Google search turned up that Super Why is an animated television series and interactive website, helps children ages 3-6 learn key reading skills, including alphabet, rhyming, spelling. Anything that encourages kids to read and think is a Good Thing in my book. So, the Super Why top is a green t-shirt with its book logo on the front and back. I did a Google image search to find the proper logo and used a paper transfer to iron the logo to the front of the t-shirt and the back of the cape. Because this was an iron-on transfer, the colors didn't come out as vibrant as the original picture, but I figured that something was better than nothing ... and I was on a time deadline. The t-shirt has long, contrast colored sleeves extending from the hem of the short sleeve of the t-shirt. 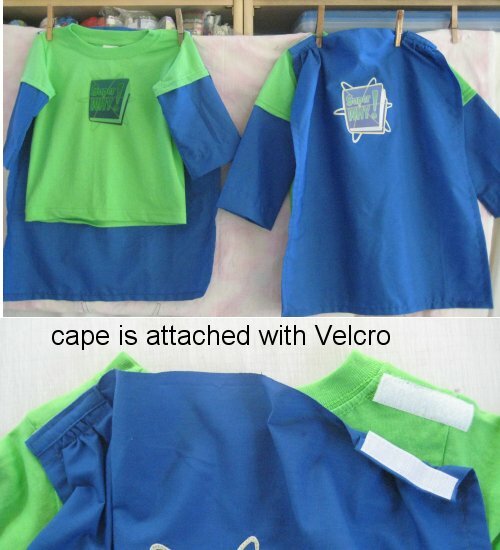 Attached to the back of the t-shirt is the de rigueur cape that all super heroes must have. :-) I attached the simple cape with Velcro strips so it could be detachable. 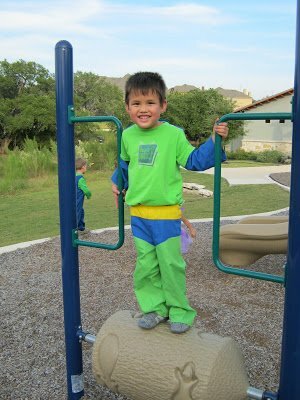 The long-legged pants have a wide yellow belt above blue briefs, which appear to be worn over green trousers. 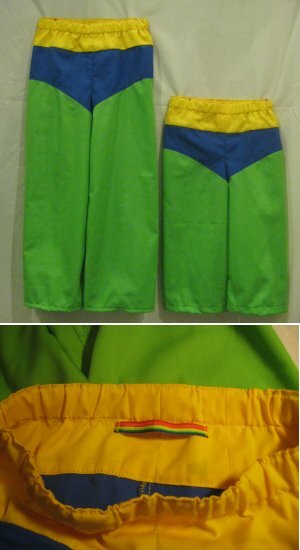 I'm pretty sure that I sewed the yellow "belt" to the top of the blue briefs and simply top-stitched the long green pants onto the bottom of the blue briefs so they were one unit. No reason to have overly complicated costumes for kids. Because EVERYONE has trouble figuring out the front from the back of pull-on pants, I sewed a rainbow tag on the back of the trousers for easy identification. Upon receipt, my friend said her kids were absolutely AMAZED with the costumes! She took a video of her kids wearing the costumes and admiring themselves in the mirror.